The difficult part of reading a Robert Jackson Bennett novel is slowing yourself down to really absorb the story because what you want to do to is read faster and faster in order to find out what’s going to happen and because the energy level of the story is on high. I jumped into this book fresh off the previous volume in the trilogy so all the key players were still familiar to me, which definitely was a help, but not entirely necessary. In a world much like our own (but perhaps after decades of rebuilding post apocalyptic holocaust), Sigrud je Harkvaldsson is a man on the run. He had gone mad when he learned that his daughter Signe had been killed and he on turn killed many soldiers. He’s been in hiding for some time, but when he learns that an old friend turned politician has been assassinated he risks his own life to seek revenge. But Sigrud will have to face more than mere mortal to get retribution. The Divine are on the rise and someone is taking their powers. Yet even to his own surprise, Sigrud discovers that he also has some powers and manages to stave off an attack by one of the Divinity who appears from the shadows. Someone, Sigrud realizes, is killing the children of the Divine and absorbing their powers. He feels an obligation to look out for the safety of a child (“Taty”) of an old friend of his – no easy task given the state of things. Sigrud takes on monster after Divine monster and is pushed to the limits of his ability and his life, but the existence of everything is at stake and Sigrud may be the only one who can save the world. Bennett’s power of world-building and creating characters that are ‘real’ – identifiable, and likable (or despicable) … characters who are understandable – we know what drives them and it feels so honest – is simply unparalleled. When you open the pages of this book, you become quickly caught up in this world and you bond with the heroes and you can’t help but believe in everything that happens. In Sigrud Bennett has created a powerful hero – one who is tested, pushed beyond his limit and is pushed some more. He’s a classic hero and through it all, we never get the sense that he is un-real or not possible. He is who we would like to believe we would be under similar circumstances. This is a powerful and exciting trilogy and City of Miracles is a truly thrilling climax to the story. Looking for a good book? 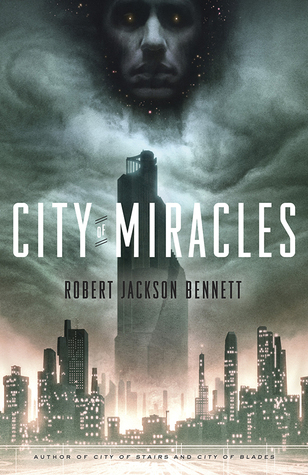 City of Miracles by Robert Jackson Bennett is a well-written, well-plotted, thrilling fantasy and you won’t regret giving this a read.